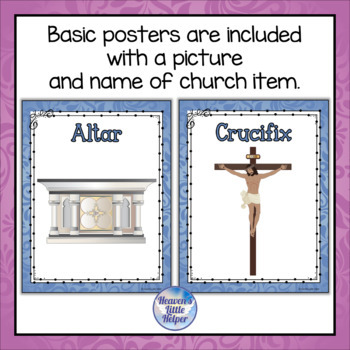 You have a choice between two sets of posters on Catholic Church items that are included in this pack. 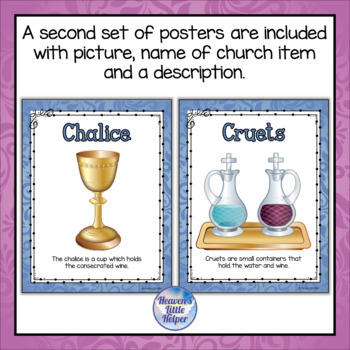 The first set has a picture of the church item and name. The second set has a picture of the church item, the name and a description. 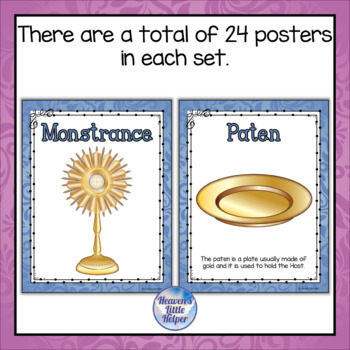 They will help your students learn about 24 different items. They can be printed on letter sized paper that measure 8.5 x 11 inches. Please look at the preview for a closer look at some of the pages. 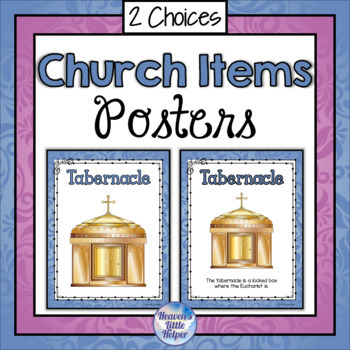 Did you know that you can receive points toward future TpT purchases by reviewing this product? If you enjoy this product, please take a moment to leave a review. Be sure to click HERE to follow me for the latest news on products and sales. © Heaven's Little Helper - Teresa Herkel. All rights reserved by author. Purchase of this resource entitles the purchaser the right to reproduce the pages for single classroom use only. Duplication for more than one teacher, classroom, department, an entire school, or school system is prohibited. Placing on the internet in any form is not allowed and is a violation of the Digital Millennium Copyright Act (DMCA).